The twelve disciples were living during the time of the first church. The Disciples had heard Jesus teach them personally. Then one by one the Disciples died. Each Disciple died for his faith except John. God saved John's life when he was put in boiling oil. God had the Disciples write books for the church. Twenty-nine of these books formed the "New Testament" to help guide the new church. Persecution (being killed for their faith) hurt the church, but the church still grew and spread everywhere. For every Christian that died for his faith, it seemed others accepted Jesus as Saviour. Satan knew that he must again apply the Satanic tool of "compromise" - combining truth and error together in a dangerous mix. 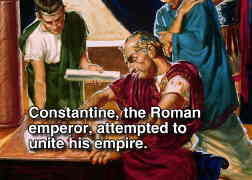 Both Christians and Jews were unpopular in the Roman empire. After the terrible Jewish revolts of 70 AD and 130 AD, laws were made against the Jewish religion. These laws made Sabbath-keeping more difficult for Christians and Jews. Trying to avoid being classed as Jews, the Christians began to change their customs. Very early, some Christians had started to keep a weekly Sunday morning service to remember Jesus resurrection. Now some Christians said they should let this habit grow and keep Sunday as a holy day. 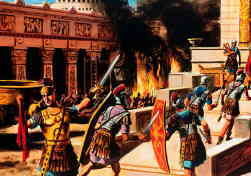 Sunday keeping was easy because Sunday was already a Roman pagan holiday. Some Christians in the church reasoned that it was easier for the pagans to become Christians if more and more pagan customs were added.. They would change the pagan customs and now make them into Christian customs. These compromises all formed a dangerous pattern: confession to a priest, the worship of saints, worshipping relics (things thought holy). The church got interested in trying to get control of the Holy Land in the "Crusades". The church began to oppose everyone who disagreed with their form of Christianity. Church and government combined together to bring persecution and death. The situation became very difficult for true Christians. But, God did not give up on the church. There were some true Christians, like the Waldensies in Northern Italy. 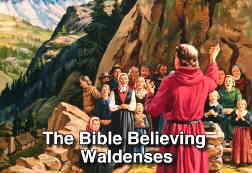 The Waldensies kept on preaching many truths of the Bible that others had compromised. Their story is amazing. Read it some time! God had plans to bring reform to the church. Go to the Next Section: God Calls for a Reformation.